Nothing compares to the Maldives. This island-nation has 1,192 coral islands that form a total of 27 atolls. Through the centuries, seafarers have wondered at the beauty of this group of islands that are chained to form a garland-like shape, which is why it was named “maldiv” or “flower island.” The Maldives is now the leading paradise honeymoon destination and one of the best vacation spots in the world. Not all the islands may be visited, though. The Maldivian government has assigned only about a hundred Maldives tourist islands, while the rest are off-limits. Some of the most popular tourist atolls are Lhaviyani (known for its exotic dive sites), Kaafu (a popular tourism hub with 25 resorts), Vaavu (a boot-shaped island with magnificent dive sites), Seenu (has a total of 23 islets), Meemu, Faafu, Raa, Baa, Alifu, and Dhaalu. The Maldivian archipelago has all the ingredients that make it truly Paradise on earth. It has white powdery beaches, fine crystalline sands that disappears seamlessly into the clear water, calm turquoise waters, tall palm trees leaning towards the sea, brightly colored corals and reef fishes that are visible from outside the water, and spectacular dance of strange rock formations and colorful marine life forms under water. These so many words used to describe the Maldives may be summed up in just one – perfect. The islands are very popular honeymoon destinations. Couples have about 90 amazing beaches to choose from. The most popular wedding venues are Paradise Island, Cocoa Beach and Banyan Tree Island, but this is not to say the other islands are not as stunning. Meanwhile, honeymooners are not the only ones packing their bags for a flight to this chain of islands in the Indian Ocean. According to Maldives tourism, about half a million people from all over the world come here every year. Although the islands are difficult to find on the map since they are just tiny dots, getting to them is not difficult. 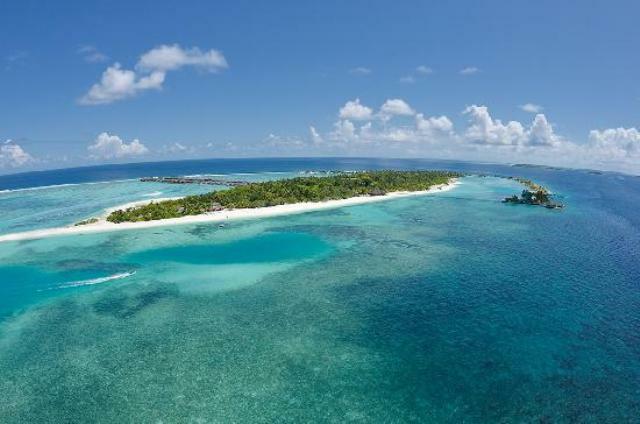 The country is most popular with European tourists, and so there are several flights from many points in the UK going to the Maldives, including a number of charter flights. The most common stop is Sri Lanka, which is just above the Maldives to the east. Visitors from the United States, Australia or Japan pass by Singapore or Malaysia. The islands also regularly receive visitors from neighboring South Asian countries such as India, Pakistan, Nepal and Sri Lanka. The archipelago has only one airport, the Male International Airport located in the island of Hulhule. Tourists then ferry to the capital city of Male for their connecting plane or boat rides to their final destinations. Some tourist islands are a few minutes away by speed boat, while others may be farther away, although none of the resort islands are more than 90 minutes away by plane. Only 200 islands are inhabited by the Maldivian people, and the Maldivian government prohibits tourists from visiting these islands, as well as the uninhabited ones that are not designated as tourist islands. At the same time, the locals are not allowed to go to the resort islands. This solves the problem of having too many local vendors by the beaches, offering and selling all sorts of beach accessories, which is a common problem in other leading beaches elsewhere in Asia. Although there is a longing to see the unknown beauties that lie in the other Maldivian islands, just one or two of the Maldives tourists islands are already enough to satisfy the avid traveller.